Today is Hallowe'en, or Samhain, the Celtic "summer's end", a time of endings, harvest, and preparing for darkness. It's a perfect day to share the incredible artistry of painter Christine Mercer-Vernon. 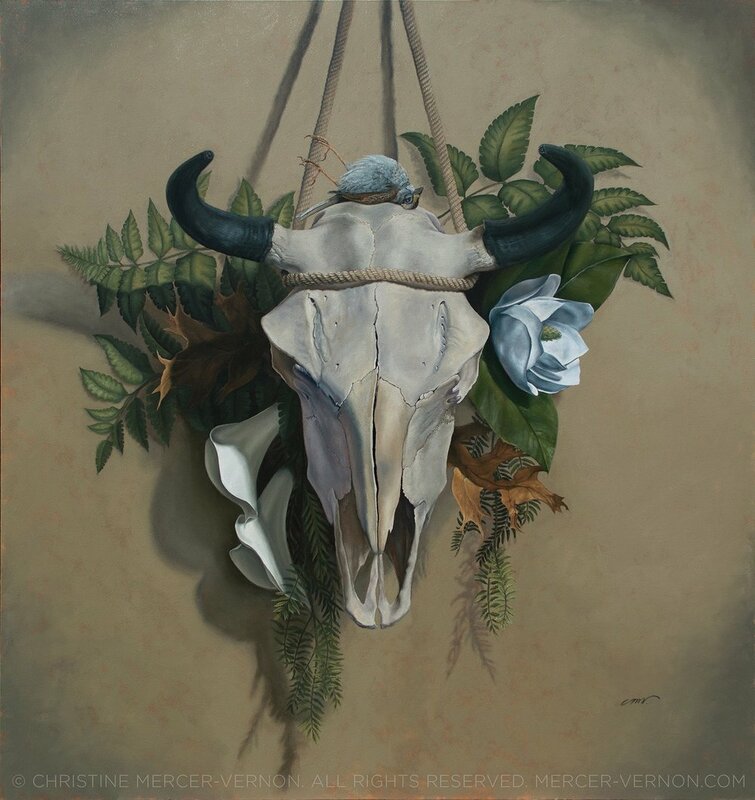 Mercer-Vernon creates Vanitas paintings, a category of still-life paintings that typically focus on objects imbued with meaning. Most Vanitaspaintings are concerned with the idea of carpe diem, or "seize the day". They are reminders of our own mortality, and also the beauty of life and being in the now. What elevates Mercer-Vernon's paintings above being technically-extraordinary still-lifes is their attachment to personal moments in the artists' life. The beauty in these skulls is in their newfound role as touchstones, as remembrances; true modern manifestations of Vanitaspainting. She treats them not as objects of macabre fascination, but as sculptural objects in a different phase of life. Personally, Mercer-Vernon's work reminds of work I wish I was doing more of myself: it appeals to me on a narrative level as well as an aesthetic one. Not every symbol in her paintings has an analogue in my own life of course, or in other viewers' lives, but we can still see a story unfolding in the contours of bone and feather, leaf and petal. If you, like me, are focused this Hallowe'en on treating endings as new beginnings; or even just love looking at expertly painted beautiful skulls, I urge you to spend a few minutes contemplating Mercer-Vernon's 30Skulls/30Days project, which ended yesterday. Each entry is accompanied by a note from the artist, which may alter how you see these marvelous bones. Mercer-Vernon also has two mailing lists, "a monthly emailed newsletter, where I give insight on my narratives and works in progress; and a postcard only mailing list, where I send out a postcard each month". Sign up here.